I recently found this 1973-S CP with fading similar to the 71-S PPL. 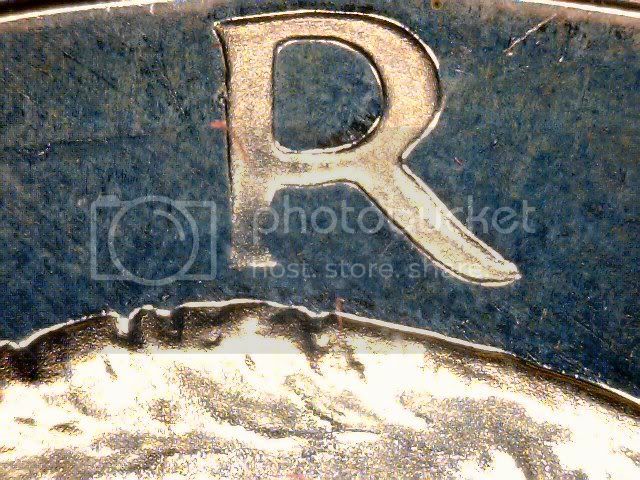 In LIBERTY, the left leg of the R is faded (though the serifs are not faded), top of the B is nearly faded away, and the bottom arm of the E is faded. In the motto, the O in GOD is broken, tomahawk T at end of trusT, and weak relief. In the date, the 9 in the is open and the 7 shows signs of doubling. Your opinions please. Doubling visible on bottom of 7 and serif. Re: 1973-S CP - another PPL-like weak hubbing? Check out the "Faded O" part! Aaron, what a great find! Hair details are reasonably sharp so this is a weakly hubbed oberse die. From our PPL "thought experiments" we can be reasonably sure this is not a weak strike as in that case details in high relief would be proportionally weaker, not the low relief details like the O of GOD. Odds are the reverse is fully struck up. Very cool find, it made me check some 73 proof sets I have and this turned up. That is one heck of a 73-S SP R whether it qualifies fully for peg leg status or not! I hope to push in our eventual book that Ikes like yours should qualify if there is no remnant of a pointy serif visible with a loupe off our left side of the leg. The flair on to our right is round and should not disqualify peg leg candidates IMHO. So I finally decided to look up the doubling I noted above in Wexler's book today, and learned that it is master die doubling (MD1). Not really anything for me to get excited about. After looking at this coin a few more times, and comparing it to my other 71-S PPL's and Almost PPL's, I would say this is more APPL than PPL, perhaps hubbed twice but not a third time.